Hello, I'm Yosshi. I entered the translating business two years ago, dreaming of an international career. Since then, every day I keep discovering more about the ever-fascinating world of translation. Recently, after reading a blog post written by my colleague Naho on Malaysia's floral emblem Hibiscus, I developed a strong interest in national flowers. I walked into a DIY shop the other day and glanced through the plants at the gardening corner. A beautiful yellow flower full of summery charm immediately caught my attention, and I said to myself "this has to be Hibiscus." However, the label on the flower pot read Hibiscus syriacus, a variation I had never heard of. Curiosity drove me to do some research, and I found out that the flower is more commonly known as the rose of Sharon, and also happens to be the floral emblem of South Korea. In Korean, the rose of Sharon is called Mugunghwa (무궁화), meaning "the never-ending flower." According to the website "Sekai no kokka, Nihon no kenka," it derives that name from its long, prolific flowering through persistently producing new growth after blossoms fall. Another website called "Seoul TOUR" gave me a more detailed introduction of the flower. However, it claims that no official record documenting the story of how the rose of Sharon was designated to be South Korea's floral emblem could be found. According to the same website, roses of Sharon have bloomed beautifully in the entire Korean peninsula all the way back to ancient times, and the flower has long been popular among the Korean. During the Goryeo dynasty, terms such as 'the land of mugunghwa' were used to refer to the country of South Korea, so it could be said that the rose of Sharon is also regarded as a symbol of the Korean history. 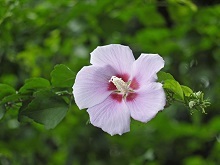 in floriography, the rose of Sharon has meanings of 'longing' and 'perseverance'. Precisely as those words indicate, the plant is sturdy, strong, and resistant to the cold. Also, individual flowers do not bloom and fall altogether, but continuously one after another, leading to a long, prolific blooming period. The blossoms start in July and end in October, making the summer a great season to visit South Korea and encounter the amazing flower of rose of Sharon. Roses of Sharon have five petals and grow in various colors such as white, purple, pale pink, etc. One variation of the flower features a single bloom with a lovely reddish hue in the middle, and is considered by the South Korean government to be the most common kind. Apparently, roses of Sharon are also nicknamed "the oriental Hibiscus," it looks like my original guess of the flower wasn't that far off after all! As a flower that's been loved by generations of South Korean people, roses of Sharon are still highly appreciated even today. A great example would be the fact that luxury hotels in South Korea are not rated as "five-star" but "five-rose-of-Sharon." Other than that, the figure of the flower is also extensively used on national emblems and decorations of honor. Japanese Translation Agency Arc Communications: Sending know-how, examples and the latest news on translation.